While I’m all about multipurpose products, I don’t typically think of my precious facial oils as the types of oils I’d slather on from head-to-toe. It’s not that I don’t want to bathe in most of my facial oils; it’s just that most of my facial oils come in 1-ounce dropper bottles that cost at least $100 a pop. 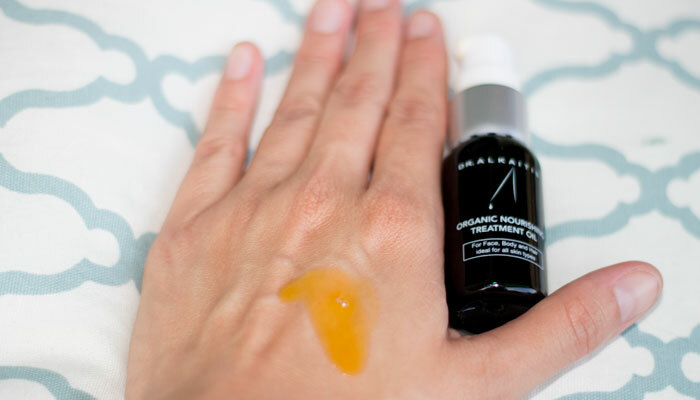 With Dr. Alkaitis’ Organic Nourishing Treatment Oil, though, I have the luxury of being able to truly go from head to toe in it, and at $90 for a 4-ounce bottle, it’s a bit easier to justify said oil baths. Designed to be enjoyed on the face, body and hair (truly head-to-toe! ), Dr. Alkaitis’ Organic Nourishing Treatment Oil is a thicker oil made from a base of virgin cold pressed organic jojoba oil, St. John’s Wort and Andean Mountain rosehip seed oil. This ultra-luscious golden-hued base is infused with Dr. Alkaitis’ signature thoughtful herbal blend that targets dryness, redness and itchiness. Wildcrafted herbs such as Indian madder, country sarsaparilla, country mallow, China root, costus, white sandalwood, cuscus grass, eagle wood, nut and bermuda Grasses and ashwagandha work together with organically grown Amazon root, liquorice and tumeric to deliver an incredible dose of antioxidants to troubled skin, soothing inflammation and calming the mind with its dusty, herbal scent that’s perfect for men or women. Indian Madderº, Country Sarsaparillaº, Amazon root* and Liquorice*. Country Mallowº, Turmeric*, China rootº, Costusº, and White Sandalwoodº. Cuscus Grassº, Olive*, Eagle Woodº, Nut Grassº, Bermuda Grassº and Ashwagandhaº. Also added are natural vitamin E complex (D- alpha, beta, gamma and delta tocopherols) and 100% pure Essential Oils. In the hair, Dr. Alkaitis’ Organic Nourishing Treatment Oil imparts gloss and shine while gently addressing any irritation you may experience on your scalp. On the face, Dr. Alkaitis’ Organic Nourishing Treatment Oil drenches the skin in a lavish cocoon of moisture. If you’re oily like me, you need to go light on the application — this is a thick oil — but during transition weather and dead-of-winter, this is an amazing choice for keeping dryness and tightness at ease without over-oiling your face and clogging your pores. I like to use Dr. Alkaitis’ Organic Nourishing Treatment Oil on cooler nights, and sometimes I’ll layer it over a light cream if I’m looking for mega moisture. What’s great about this truly multipurpose oil is that as I’m layering it onto my face and pulling it down my neck and onto my chest, I can keep the party going onto my arms, stomach and legs, as a couple pumps can cover a lot of ground. However, I am generous with this oil on my body (as I am with all of my body oils) but mostly because I don’t feel so bad using so much because of the generous sizing in relation to its cost. While I’m sure all of you beauties out there are diligent about moisturizing everything, it’s probably safe to say you don’t always go from head-to-toe with one oil or lotion. Which leads me to thinking … how do you deal with all the scent confusion? With Dr. Alkaitis’ Organic Nourishing Treatment Oil, you can have one signature scent for bedtime, head to toe, that’s actually quite soothing for bedtime. It’s an especially beautiful pick for autumn and winter, as the herbal-woody scent evokes a cool-weather coziness that puts me at ease. 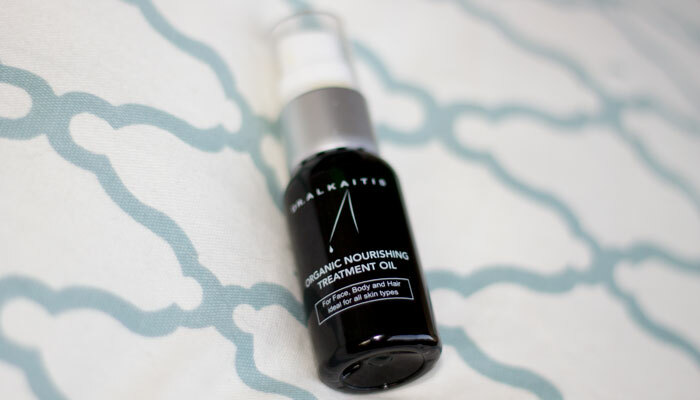 Dr. Alkaitis’ Organic Nourishing Treatment Oil is a repurchase for me. I’ll keep it stored with my body oil collection, as that will be my first and foremost use for it, but several cooler months out of the year, it will see some play on my face as it adjusts to cooling temperatures. If you’re into body oils with unique scents, you’ll want Dr. Alkaitis’ Organic Nourishing Treatment Oil in your arsenal! Have you tried Dr. Alkaitis’ Organic Nourishing Treatment Oil? Do you use it primarily for hair, face or body? What scents are you drawn to during autumn and winter? Tell me in the comments section!